Kennedy Mavunganidze: You have a gift of writing and telling the story. I have learned a lot after reading your book and in my view you have captured what I believe is a reflection of the whole history. More importantly, you were using Shona and Ndebele words appropriately. You might as well think of turning the book into a movie …! Heather Thorne: Aaaaahhhh maaaaaaaiweeeee, I’m so enjoying your book. Devouring it. And I’m only about a third of the way through. And oh my word, I’ve edited many southern African history books that describe the battle formation of the horns – but I’ve never actually felt it in my bones – and the zhiii of the spears must have been terrifying. aidan lane 4.0 out of 5 stars A great read! 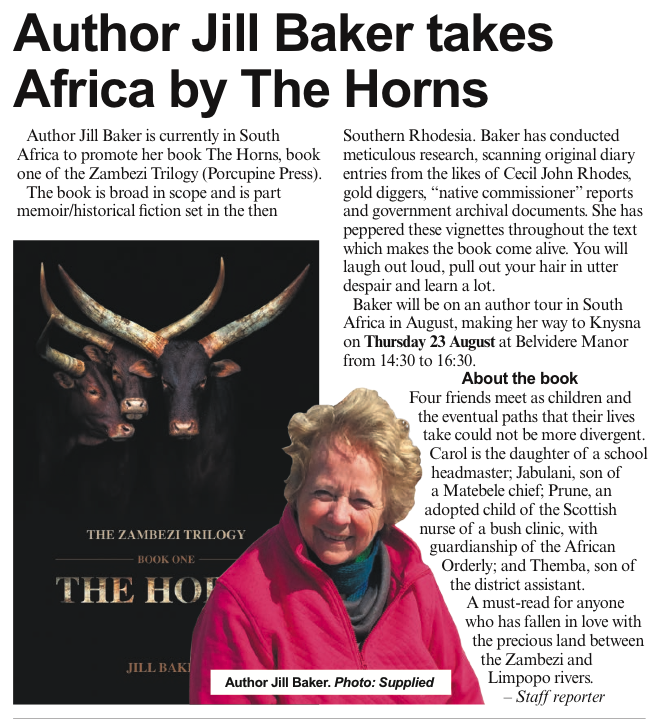 7 October 2018 Format: Paperback Verified Purchase The craft of Jill Baker in fusing thoughts of real-life historical characters with those of very plausible current characters was great. She has the very great art of remaining credible throughout. In so doing she kept me ever-anxious to get on to the next stage...as I still am. She left off in book one just as I arrived to live in Rhodesia/Zimbabwe for 42 years - I will then await with bated breath for books 2 and 3 which I know will be great reads too.